From the Chimney Rock trail we took the trail into Spring Canyon, which took us down into a wash with sheer canyon walls on both sides. The color on the sandstone in the morning light was very pretty. There were also a lot of wildflowers in bloom. The day had started out with blue sky and sun but it was (still) windy. Howard (the weather guy in the eastern Sierra) would call it a day of "high vorticity". :-) As we were headed back we saw a bank of black clouds coming towards us, and then Walt and I both smelled rain in the air. I had a bad feeling about this... :-) The wind had *really* picked up - we had to go over sort of a pass, and it was a LOT of work going against the wind - we figure it was gusting about 45 mph. We still had about a half mile to get back to the car when it started raining...and then it turned to hail...and then snow!!! Fortunately it wasn't very heavy, and after about 15 minutes the storm blew through and it was mostly sunny again. After we looked around the Visitor Center we went into Torrey to have lunch and do laundry. 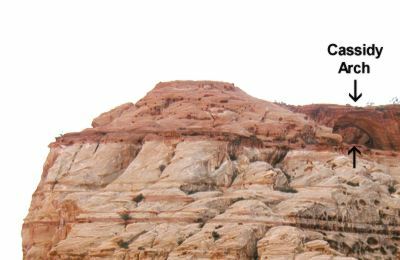 :-) In the afternoon we drove back into the park and took the scenic drive into Capitol Gorge. 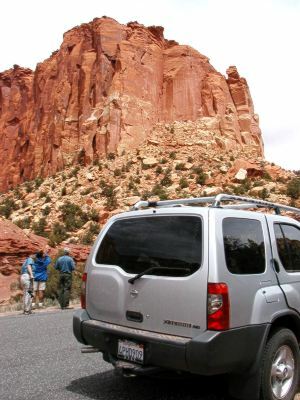 One very unique feature of Capitol Reef is the orchards - Mormon settlers planted cherries, apples, peaches, plums etc. in the area (which they called Fruita) and the park service has continued to tend the orchards. When the fruit is in season the orchards are open to the public and there's no charge to pick it. 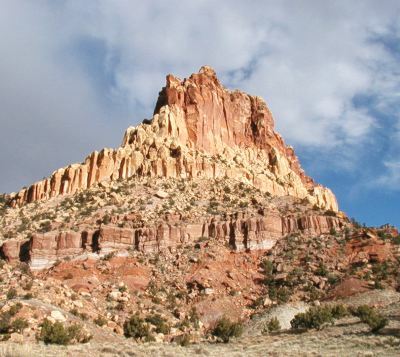 My most vivid memory of Capitol Reef from that trip when I was 8 is picking cherries in the orchard. 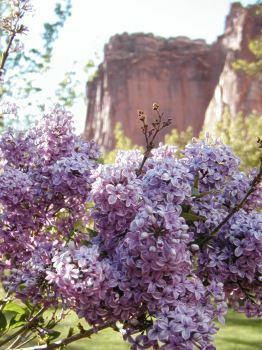 Unfortunately it was way too early for there to be any fruit, but some of the trees were blooming, and the lilacs, too! On the way back through Torrey we had dinner at the Capitol Reef Cafe, which was the other place that our innkeepers (and the Lonely Planet guide) had recommended. Though it didn't have quite the style that Cafe Diablo had, it didn't have the price, either, and it was still very good. They had a nice selection of pies for dessert - sweetened with honey rather than sugar. For a change we actually managed to have dinner before 8:00!!! When we woke up, there was a dusting of snow on the ground!!! It looked very pretty, but melted as soon as the sun hit it. After another nice breakfast - more fresh muffins, fruit, and "egg quesadillas" we packed up and were on the road by 9:30. But first we had to say goodbye to Pedro the llama. Near Muley Twist there was a corral with a flock of sheep in it - and one llama. 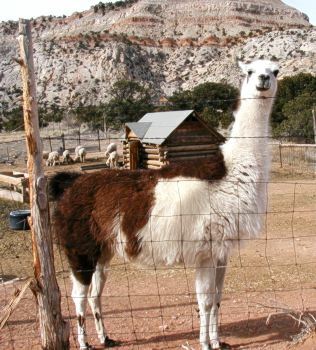 We figured he must be their guard - llamas make very good guards, since they aren't afraid of coyotes or dogs. We don't actually *know* that his name was Pedro...but that's what we called him. :-) We pulled up by the fence and he got up and came right over to check us out, posed for a couple of pictures, decided we weren't a threat and turned around and left. Pedro has attitude. :-) And he's awfully cute, too! From Torrey we took SR 12 - a road that's a designated Scenic Byway. It went up into the mountains - the terrain and vegetation reminded us of the drive to Rock Creek in the eastern Sierra...and then we saw a sign for Rock Creek! SR12 goes across and down a narrow ridge called the Hogsback - it was quite scenic, but we told Lee he wasn't allowed to sightsee while driving! :-) We stopped at several viewpoints, though. We also stopped at an overlook called "Phipps Death Hollow"...According to local legend, two ranchers - John Boynton and Washington Phipps - had an argument over (what else?) a woman and Boynton shot and killed Phipps. Boynton turned himself in to the Escalante sheriff who gave him $10.00 and told him to go to the county sheriff in Parowan, but Boynton disappeared and was never seen again. Good story, huh? 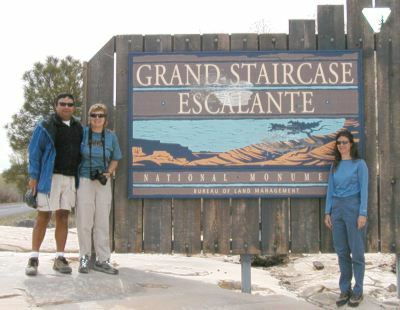 "The Staircase is a large-scale erosional feature caused by the uplift of the Colorado Plateau. ... 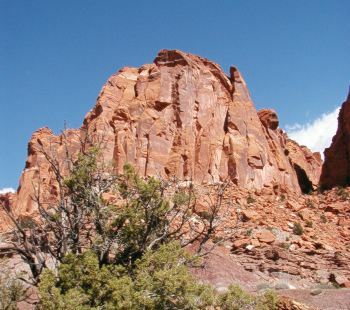 Ten million years ago, the local tectonics changed and the Colorado Plateau began a slow uplift. 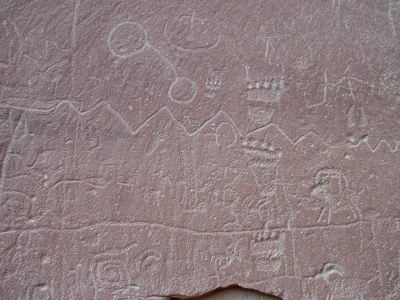 As the region rose, gravity and physical weathering eroded the sediments, forming great cliffs, canyons, terraces, and mesas. The Staircase formed due to differing erosion rates between hard and soft layers. 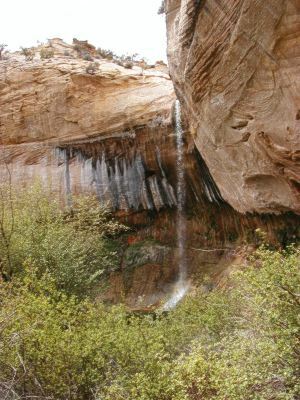 Hard layers formed resistant cliffs (risers), while soft layers formed terraces (steps)." So that explains it all, right? 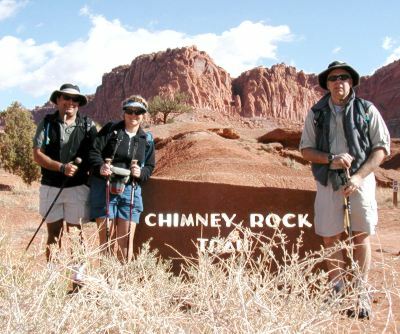 :-) There are canyons and rivers to explore, waterfalls, arches, and, of course, colorful rock formations. 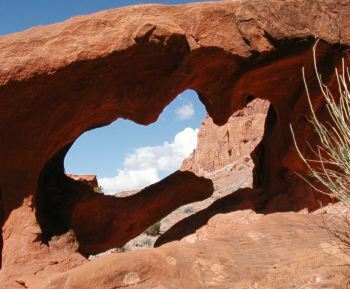 It's a big park - almost 1.9 million acres. We talked to the lady at the information desk (hmmm...does the BLM have rangers?) and got maps and hiking suggestions for the next day. Oh, and you remember that other silver Xterra? They were at the Visitor Center, too!!! 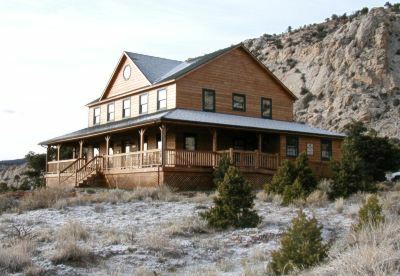 Back in town we checked into Escalante's Grand Staircase Bed and Breakfast Inn, where we had the "Cadet" and "Antique" rooms. This was much more like a motel than anything else, but the rooms were large and clean and comfortable. Though one problem that we had at all the B&Bs (except the last one) is that they did not have a table in the rooms, which made writing postcards or using the computer a little bit of a challenge. But this B&B had one thing that none of the others did...CATS!!! 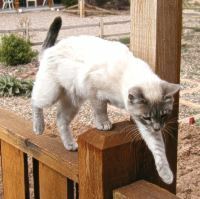 There were 7 very friendly cats wandering around - this is Abby, a beautiful blue lynx point Siamese. It was nice to see kitties again! 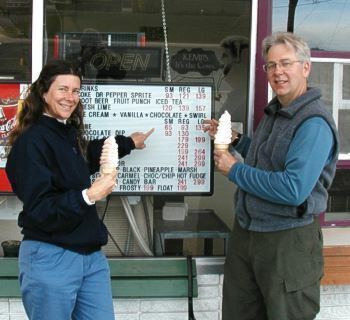 After dinner we walked through town - there was a place at the other end of town that sold soft serve ice cream...we were amazed at the size of the cones we got for the price!!! I had a small and Lee had a regular - mine was $0.65 and his was $0.93! They were HUGE!!! I think we were all back in our rooms by about 7:00 that night - our earliest day so far, but we were getting a little tired, so it was nice to have some extra downtime. And you have to admit that we'd done a lot in 6 days! Text and photographs copyright © 2003 by Laura Gilbreath. All rights reserved.